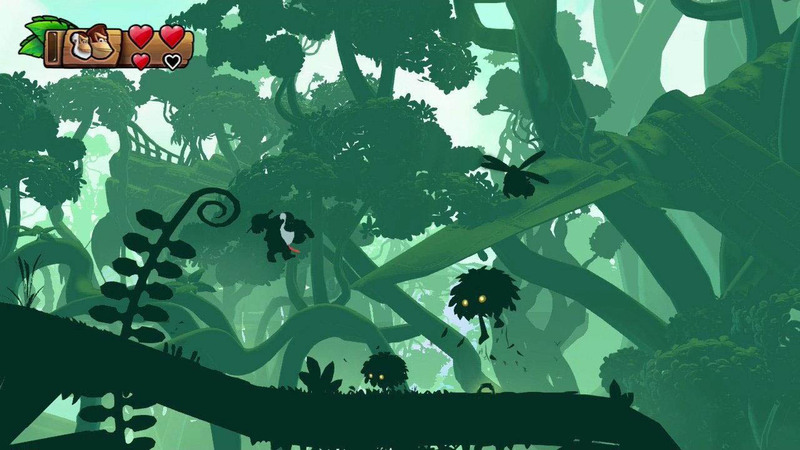 The team behind Donkey Kong Country Returns, er, returns for a solid iteration on their 2010 reboot. When the original Donkey Kong Country launched in 1994 as Nintendo's 16-bit console war coup de grace, you couldn't help but be on board for a game made with the unimaginable power of — GASP! — Jurassic Park-rendering CGI machines. When the novelty of DKC's impressive-for-the-time graphics faded, though, the wizard behind the curtain was revealed as just another shallow platformer, one that lacked the sheer craftsmanship of Nintendo's first-party Super Nintendo titles. And when the supremely inventive Super Mario World 2: Yoshi's Island released the following year and caught barely a whiff of DKC's fame and adulation, that was the last straw: Donkey Kong was dead to me. It's hard to believe, but that was nearly 20 years ago, and while I've dabbled in DK here and there, anything branded with his hideously rendered mid-'90s mug acted as a warning sign for these past few decades. And while the Kong family's designs are forever stalled in Clinton-era amber, the world Retro (formerly of Metroid Prime fame) crafted around them in Tropical Freeze makes for a much more appealing take on platforming action. Theory: Cranky Kong takes a wrong turn and ends up fighting Fry Guys in McDonaldland. Of course, if you played 2010's Donkey Kong Country Returns, none of this should really be news to you; if anything, Donkey Kong Country: Tropical Freeze is the New Super Mario Bros. U to Donkey Kong Country Returns' New Super Mario Bros. Wii. Like Returns, Tropical Freeze brings Donkey Kong back to basics by focusing on the titular character; DK can team up with a handful of his relatives, but they act more like Mario Bros.-style power-ups than co-op partners. Diddy gives DK the ability to hover after a jump, Dixie provides a double-jump, and Cranky can bounce DK off of the ground with a pogo-cane move undoubtedly stolen from DuckTales. Certain stages are designed with specific secondary abilities in mind, but others allow for a choice between the three, letting you decide what approach would work best. Of course, if you take a few hits with a fellow Kong strapped to your back, you'll be stuck with the relatively limited powers of DK himself. Like Donkey Kong Country Returns, Tropical Freeze doesn't mess around; it's demanding from the get-go, but rarely in an unfair way. Outside of the forced-scrolling rocket sled and mine cart stages, Tropical Freeze takes a page from Super Mario 3D World by never lingering on one idea for too long. In one stage, you'll be swimming frantically to the surface while a massive squid lurking in the background attacks you from all angles, while another will have you leaping across platforms that light up with energy-draining electricity when they pass by glowing nodes in the background. Even the long, multi-stage boss fights feel like levels in and of themselves; it can be annoying to start over from square one when you lose, but these overpowered foes rarely run out of new tricks before you stomp their heads one final time. The stages of Donkey Kong Country: Tropical Freeze are peppered with hidden trinkets, but thankfully, the developers have snuck them into stages a little more thoughtfully than expected. While the typical letters K, O, N, and G can be found out in the open throughout most of the game, Tropical Freeze's puzzle pieces — used to unlock art, music, character models, and other extras — reward performance as well as experimentation. Some provide compelling answers to questions like "What if I figured out how to jump up there?" while most of the others are hidden away in mini-challenges that involve collecting all of the bananas that pop out of a background element before they fade from existence, or nabbing the ones strung up between some particularly dangerous territory. Even if you go into a stage with the intention of sniffing out most of these pieces, odds are, you're going to walk away with less than half—if you fail to do what the game demands for a puzzle piece, there's no way to give it another go unless you off yourself and respawn at a past checkpoint, or finish the stage and enter it again. The premise of Tropical Freeze doesn't seem quite so outlandish after the weather we've been having this winter. Donkey Kong Country: Tropical Freeze can be downright devious, even if lives are plentiful—I distinctly recall losing 30-odd Kongs during an unusually evil section in the second-to-last stage. Mercifully, the game provides an in-game store in which to spend the hundreds of coins you pick up throughout the stages. At best, the power-ups offered exist to give you a nudge in the right direction, which cuts down on the shame of needing outside help. For instance, I was stuck on one of the later bosses for 20-odd minutes, and instead of continuing to bash my head against that particular wall, I opted to buy an extra hit, which managed to give me just the right amount of leverage I needed. Tropical Freeze also lets you rent a friendly parrot that sits in the corner of your screen and springs to life when you come near a puzzle piece — whether or not you have the skills to unlock it, though, is still on you. Though Nintendo may run the risk of running a good idea into the ground if they go for another Donkey Kong in this style, Tropical Freeze stands as a follow-up to Donkey Kong Country Returns that offers just enough new ideas to justify its existence. And though its kid-friendly exterior may lead you to believe it's a kid-friendly romp, be warned that it's definitely one of the most difficult platformers I've played where extreme challenge isn't the central conceit (a la Super Meat Boy). If you're up for having your 2D platforming skills pushed to their absolute limits, and you don't mind staring at the bug-fugly Kong brood for 15 hours, Donkey Kong: Tropical Freeze is a fine addition to your Wii U library during these slow winter months. Visuals: While the Kongs are still trapped in an era where Pearl Jam ruled the airwaves, the worlds and enemies are creative and colorful in a Dreamworks-y sort of way. Sound: Original Donkey Kong Country composer David Wise returns for this installment, giving Tropical Freeze a soundtrack exceptionally confident and eclectic for a game about an ape collecting bananas. Interface: Simple and straightforward, and with an option I've never seen before: if you choose to play using your TV, the screen on the Wii U GamePad shuts off, giving you measurably more battery life. Lasting Appeal: Even if you're a platforming master, finding all of the DKC:TF's hidden content is an extremely tall order. 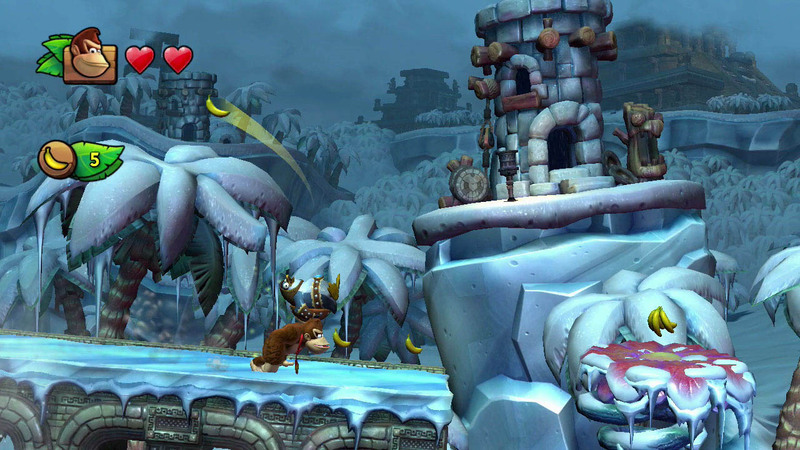 Donkey Kong Country: Tropical Freeze isn't the most ambitious game, but it throws its characters into unique and clever challenges with each new level. Nintendo would be pushing it if they went for another Donkey Kong game in this style, but for now, Tropical Freeze can sit alongside Super Mario 3D World as one of the finest platformers of this generation. Tagged with donkeykongcountryreturns,	Puzzle,	Reviews,	Wii U.